THE GOLDEN RULE. 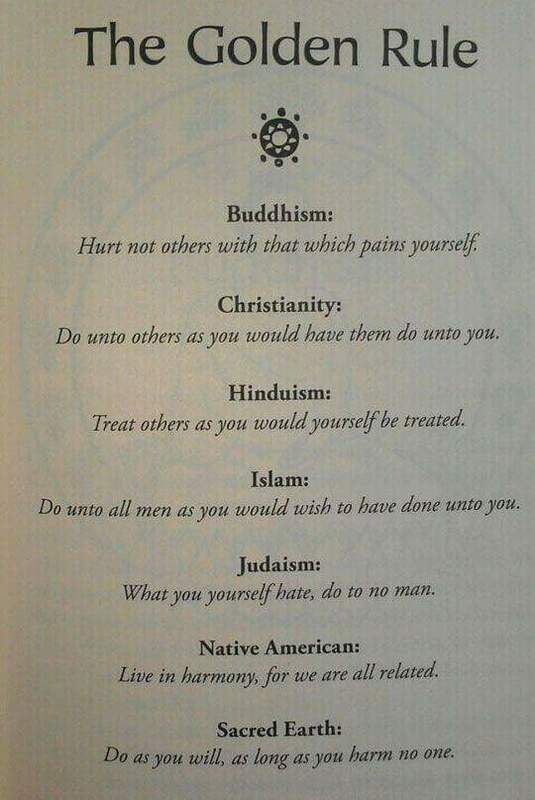 The basis of every religion and shown in this picture perfectly. I will never forget the first time I saw this picture, it was at a pow-wow I was at. I actually got chills reading it. Virtually every faith has the basic belief to treat each other as they wish to be treated. Then confusion set in. IF every faith believes this, then how come there is so much conflict between them? That is the million dollar question that has plagued man for centuries. How can men of different faiths not only all get along, but work together to bring peace and love to the earth? By doing just that – working together. Most of us believe our faith to be the one true faith. That is fine, but understand that just as much as we would not enjoy hearing our beliefs are incorrect or spiritually lacking, neither would any other faith. It is ok for you to believe what you do and them to believe what they do, even if that happens to be different. Let us instead strive to learn what we can from each other and to view each other with love and compassion. There were lots of universal truths presented here in this blog this week. If you have not had a chance to view them I invite you to do so. There are quotes that have inspired me from at least 3 different faiths. My apologies for those faiths I did not quote from, I promise in the future I shall show some amazing inspiration from yours as well. Which is what this is all about. We can learn so much and accomplish so much more by working together than we can focusing on our differences. The above example of the golden rule is but one example of the basic truths we all hold dear. The more you search, the more you will find. Sure, there will be differences and we must treat those with respect. As long as it does harm to nobody, we should all be free to believe and practice as we do. Our ritual may be different, our wording may be different, but our love can still be the same. Next Post WHAT IS VALUABLE?